... everyone relax, it's not my nursery. I'm not pregnant! I'm talking about the gifts i've been making for a friends nursery! She's due to have a little girl the end of January and while i will be making a quilt for her i wanted some things for the nursery that i could give at the shower next weekend. I started with an easy project, Nova's Nesting Fabric Bowls. And i have to say, if ever you need a quick gift for someone, this is it! They are super easy to make and the instructions are fantastic! I also love that at the end of the instructions she's given all kinds of tips and ideas to change up the bowls. With necessary instructions! I kept things simple for my first time around but i definitely want to try some with a bit of piece work... i'm thinking one of AMH feathers wrapped around a bowl or two! Crap now i want to make one for me! No! After Christmas! (but don't be surprised if i don't listen to myself and just go ahead and make one now!) Sorry, i tend to get distracted easily. The instructions called for medium weight interfacing for both the exterior fabric as well as the lining. I didn't use it on the lining for the two smaller bowls just on the exterior fabric and i have to say that it worked great! I actually preferred it without the interfacing on the lining. That being said i did use a heavier interfacing than what was called for. Both the larger bowls had the heavier interfacing for both lining and exterior and it was definitely needed to keep their shape, but i think an even heavier interfacing on just the exterior, or interfacing with some batting and quilting would be perfect! My friend has painted the nursery a pale aqua and is using grey and lavender as accents. And i have to say, when she told me her colour scheme i totally didn't know what to think. I had a really hard time finding fabrics that i was happy with that didn't read as weird. And that's where the Sarah Jane Children at Play print came in. As soon as i pulled it i knew that it was going to be my jumping off fabric. I then chose the Lizzy House Pearl Bracelet in lilac and the Kona Steel, as well as the little blue pindot which was from Connecting Threads. I was lucky to come across the baby newsprint and the lavender stripe while out shopping with my mom. The newsprint is from the Baby Business line by Jackie Clark for Benartex and the lavender stripe is a Stof quilters basic print. All in all i'm pretty pleased with the resulting colour story! And i hope she will be too! I also finished up the Noodlehead divided basket for her shower gift. I used the same Kona Steel for the outside, and the newsprint for the pocket. And again, another superbly written pattern with lots of clear pictures! I made this with the same heavy interfacing as the bowls and only on the exterior fabric. I think i would really like this one with a heavier weight fabric or even quilted. Mine doesn't seem to stand up as well as i would like, but i imagine it will when it's stuffed with assorted baby accoutrements! The lining is a super cute Little Golden Books print by Quilting Treasures that i thought was pretty great... i plan on adding in some Little Golden Books into the basket! I'll definitely be posting some pics next week with all the goodies added in! I still have a couple receiving blankets to make and maybe some little booties from AMH's Handmade Beginnings book. We'll see! And i finished my set of teacups as well. Using the Flight print from Waterfront Park, i plan on matching my teapot to the set as well and i can't wait to make it, though i think i've said that about most of this quilt! Cute eh! Well i guess that's about it for today, i have some things on the go that i was hoping to share today but i just haven't had the time to snap some pics... next week! High fives for the weekend!! Hope you all enjoy it! Linking up with Kristy for her Paper Piecing Party, always awesome over there and of course with Amanda Jean for Finish it up Friday! OH em GEE that big bin with the let's pretend fabric--freaking perfect, looove it! Now I have a reason to buy that fabric, right?! Love the newsprint too! You sent me the clouds first so it kind of went full circle! Love all of your pretty projects!! but i must say in your first photo the carved looking rabbit and cute books kind of steal the show. I think you definitely pulled the perfect fabric for your friend's nursery color scheme and i think she will love them as well as get a lot of use! 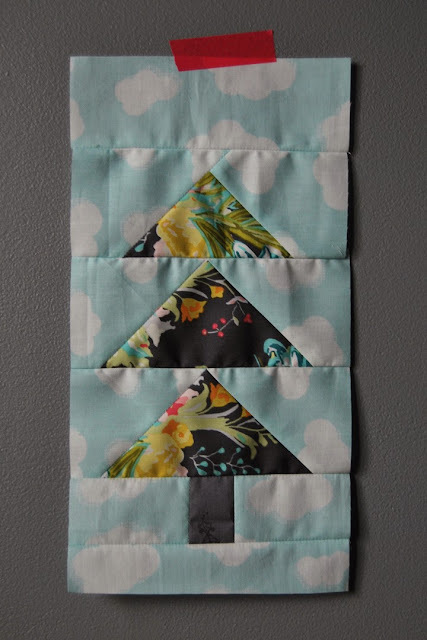 your Penny Sampler blocks look awesome and i have enjoyed seeing that quilt come to life!! Oh those baskets are so sweet! You chose beautiful fabrics! Loving your teacups! Super cute! Such a cute gift for your friend's little girl. Absolutely gorgeous! 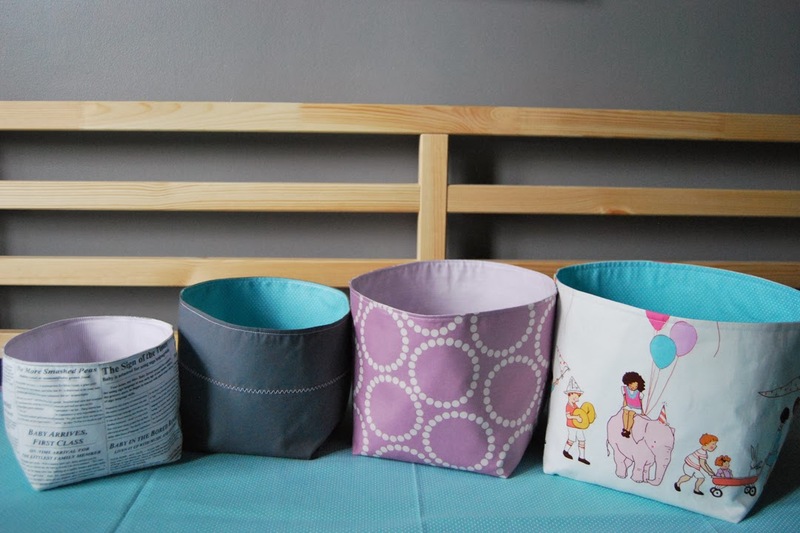 I really need to buy that pattern - we need some fabric baskets around the house. Yours are divine. Beautiful work, as always. I absolutely love those tea cups, I can't wait to see the teapot. If I were you I would make extras as coasters or mug rugs, and a teapot one to pot the teapot on. Great work! So much adorableness in one post, I cannot stand it! In my dreams I have a tea set just like that ;) Don't even get me started on the Little Golden Books print by Quilting Treasures. How perfect is that!? You are awesome. Gushing over....for now. I love that white bunny in the first picture. He's great! Such an awesome shower gift! My sister had those colors for her wedding and I had a really hard time getting it right. Yours looks amazing. And those tea cups are adorable! Take that Q3 FAL list!